Please allow me a few words of reflection this morning before we get to the forecast. (It really hasn’t changed much—2 to 4 inches of rain for much of the area, with the potential for greater amounts possible in some locations. We have some concerns, which we discuss below, but don’t anticipate major, widespread problems at this time). Amazingly we have been talking about the rainfall for “this coming weekend” for nearly a full week. 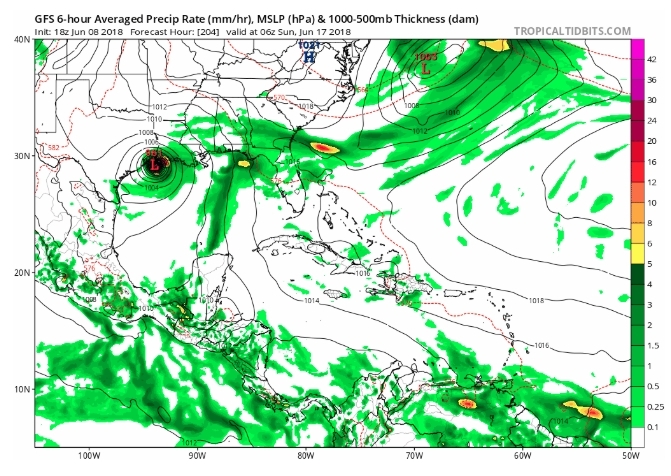 This began late on the afternoon of Friday, June 8, when a couple of local forecasters looked at the GFS operational model (re-posted below) and called attention to the fact that it showed a hurricane moving into Texas on Sunday, June 17. I was taking a family vacation at the time, but received several messages from readers concerned about this, so I asked Matt to write about it. He authored an excellent update titled, “Yes, we saw the Friday PM GFS model; we aren’t stressing.” This kind of perspective is precisely why we started this site. What concerns me is that we have now been writing about this event for a week, and there is a non-trivial chance that for much of Houston this will not be more than a few significant thunderstorms. This sort of rainfall does not warrant the amount of attention it has received. 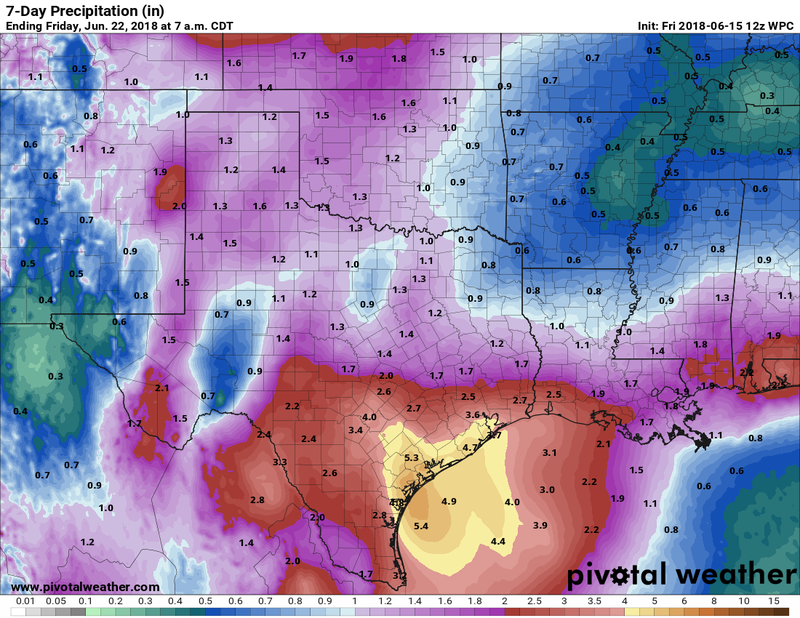 And if Houston does receive the 2-4 inches of rain over a few days that we anticipate, it will degrade public confidence in meteorology as the hype will not match reality—i.e. the boy who cried wolf. I understand that people are highly sensitized after Hurricane Harvey, but every storm is not Harvey (or even close). So I just wanted to reiterate what I wrote at the outset of hurricane season: “Social mediarology” plays on the fears of people, and therefore tends to get shared widely. If you’ll promise to not fall for these kinds of fear-mongering posts, we’ll make a pledge to you: If we believe there is a credible threat to Houston, we will report that immediately. And if we haven’t written about it, the post you’ve seen on Facebook is probably garbage. Fortunately we have a sponsor like Reliant, which doesn’t value clicks, but rather reliability. Now, on to the forecast. More of the same that we’ve seen this week. Moisture levels are high enough to squeeze out some showers mostly during the daytime hours, with highs in the low 90s under partly sunny skies. Rain chances are better Saturday than Friday. If you have outdoor plans there’s a decent chance showers will pop up to disrupt your outdoor activities, but probably not for too long—except for areas immediately along the coast. By later Saturday night or Sunday, tropical moisture will surge into Texas, and produce some heavy rainfall. For most of Houston this probably means accumulations in the 2 to 4 inch range, with the lower end of that range for inland areas, and higher totals near the coast. We also can’t rule out some bullseyes of 4 to 8 inches of rainfall, but these should be mostly to the south of Houston (we think the threat for heavier rainfall is now closer to Corpus Christi than it is Houston). Our big concern with this system is rainfall rates. Tropical moisture is unpredictable, and has the potential to really pump out rainfall, so we could see a few areas hit by 3-inch-per-hour rainfall rates. This will definitely cause localized flooding, but we can’t say where this will be. Our bottom line remains the same: You should be wary of this weekend’s potential for rainfall, but don’t be too worried. Check the radar before you venture out on Sunday and Monday. We’ll be keeping close tabs on it, and if you want our latest updates when they happen, a good way to get them is by subscribing to e-mail updates in the box on this page. Rain chances remain healthy on Tuesday, but the potential for heavy rainfall should begin to ebb. Highs probably will rebound into the low 90s by the end of the week, with drier, mostly sunny weather by the end of the week. Thank you for providing rainfall maps with numbers for us color challenge people. Our cruise leaves Galveston on Saturday afternoon, so I’ve been watching for your updates daily! What impacts, if any, do you think this system will have on our plans? Do you think we’ll be delayed or plans modified for rough seas? Thank you- you guys do excellent work! Thank you for your thoughts on the soap mongers that, to sell soap, can sensationalize a flat tire. We have stopped listening to local weather other than to note the drama. We appreciate not only your forecasts but we enjoy the science behind them. This is why I love and RESPECT this site and your work!!!! Thank you for continuing with this and thank your families too. Thank you, Eric and Matt! I tell everyone about your site because you don’t fear monger. In fact, my elderly non-tech mom who lives in Port Arthur called me last night and asked ‘what does Eric say about the storm?’ Thank you for your truthful reporting! Thanks, Eric and Matt. This is my one true source for weather information. It’s that time of year….you should be adding precise instructions to Katy for the next 90 days. I left noon yesterday for a meeting in the Golden Triangle and was hit with unexpected heavy rain between BW8 and 99, and around Winnie. It was so bad around 99 I was down to 20 MPH and thinking of pulling over. By the time I hit Jefferson County, there was nothing. Keep on guard when travelling this weekend! Well done Eric (and Matt)…again. Top notch clarity is appreciated. We have a beachouse in Galv for Father’s Day. We have board (bored) games standing by. Not to distract too much from the “OMG it’s going to rain ” preoccupation, do you have an opinion regarding the US Climate Prediction Center’s El Nino watch for December to February (up from 49% to 64%)? I am a long time follower (from your Science Guy days) and appreciate the no-nonsense, non-hype approach to forecasting that you and Matt display. You are my first go-to when I want to see what to expect. Thanks again. Keep up the good work. Please let me know when Smiley, TX should evacuate. I am flying out of the international airport on Monday morning to go on vacation. Will I be able to get there? Do Uber drivers drive during heavy rain? Will flights be cancelled? I am also flying out from IAH Monday and my daughter from Hobby! I have the same concern. My personal recommendation is to leave early and bring a book or other personal entertainment! Better to be sitting there waiting (even if your flight is late), than to miss your flight because it took longer to get to the airport than you anticipated! Good luck to all travelers! This is my air-travel philiosophy too! My husband’s is the direct opposite. He says perfect timing is if he strolls up to the gate just in time to be the last to board. Delays are possible, but at this time I wouldn’t be overly concerned about long delays. Thank you for the pledge. It’s a nice reminder, but I already trusted you. Thank you to Reliant for making it easier for this Dynamic Duo to help Houston. It’s a little rain people! Everyone take a deep breath and move forward with your lives. It’s a little rain people! Everyone take a deep breath and move along. And this is exactly why I follow Space City Weather. I think some of the local stations love to mess with the people’s heart rates. Well said…I have been fighting off a stubborn illness with a second course of antibiotics…I come off of these antibiotics tonight..I have follow up doctor appt Monday..I have been feeling anxious due to worry that I may get sicker late weekend / Monday and find myself stranded at home due to impassible roads caused by flooding.. Thanks for the hype free, professional, weather reporting. Thanks to Reliant for sponsoring you. I re-upped with them this year in part because of that. Thanks for the peace of mind and accuracy! Eric, I’m flying into Hobby on Sunday around noon. Should I anticipate any complications with those plans? Do I need to go into my “how much rain on the northern 1/8th corner of my lot” rant again? Wouldn’t do anything except give the rest of us a chuckle. It baffles me how someone can read the entire article and still ask questions about ONE SPECIFIC STREET CORNER at a specific time of day. I mean not completely baffled, but enough to want to declare beer-thirty several hours earlier than normal, haha! I guess some either don’t understand the limitations of weather forecasting or can’t handle situations that are generalized or ill-defined. THANK YOU for keeping me sane through m Tax Day, Harvey and beyond.. my house is almost finished! God bless the common sense!!!!!!!!! You are a godsend and very much appreciated! Yesterday, I got deluged with 2″ in about 30 minutes, and I fear we’re going to have a severe band that will park over Houston for a few hours. Call it a bad gut feeling, but I feel like this will be similar to a Memorial / tax day flood. Hope I’m wrong. I asked Matt about this the other day. He said not at all that close. Let’s not feed the hype beast. And I flooded tax day and Harvey. Weather happens. Thank you for focusing on what matters. This is why your audience is large and faithful. Hype is what makes the world go around. Your calm empirical analysis gets me through the day, not the TV guys and not the “sky is falling” reactionaries. Thank you, Eric and Matt, for your honest, down to earth, hype-free, and educational forecasts! Thank you, Reliant, for partnering with this team to back and provide reliability!!! So if Houston DOES get 2-4 inches, someone cried wolf? I think you meant DOES NOT, no? English is a difficult language. At least for me. I believe you are already subscribed. “You have already subscribed to this site. Please check your inbox. I really appreciate your clear, calm forecasts. Thank you Eric! You are so comforting. My dear Fulgencio has been so stressed today because of the waves of feelings from Spain versus Portugal and with the talk of the floods on the television he has been almost inconsolable! I showed him to read this article and now he is comforted. We hope for the rains and that all are safe and happy this weekend. Blessings! During the Harvey event (flood), your forecasts were always spot on. We at radioKair check all the weather agency’s before reporting and yours is always the most accurate and never dramatized. I don’t think this event will be significant enough to be remembered. 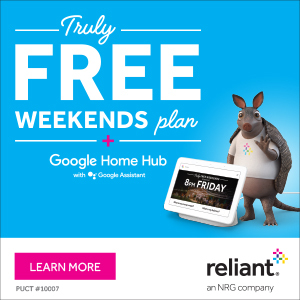 Thank you Reliant for supporting reality! Would you say there is very little chance that the bayou will breach in Meyerland (S Braeswood and Millbury)? Supposed to be laying sod Saturday morning – rain is good, but standing water for a significant period, not so much. My street/yard don’t flood unless the bayou floods. May seem trivial but it’s thousands of dollars in sod, the last part of our post-flood repairs! I would say the chance of this is probably significantly less than 20 percent. How do you think this will affect those traveling out of Hobby or Bush airports this weekend? Difficult to say, but I don’t think the effects will be too significant. I don’t think this will be a major lightning event. I, for one, value the reporting that goes “there is a very small chance of this happening, but just in case…” I’m glad this is a nothingburger (in the parlance of our time), but it gave me a reason to clean the gutters and drains, check my flashlights, test the generator, etc. Hope for the best but prepare for the worst when you live on the Gulf Coast. honest to goodness first class service…. No lie – like 30% of the reason I come here is for the weather snark from you and Matt. Never leave disappointed! And, what is this about another area of potential tropical development right behind this one? Eric — will TS Carlotta, or the remnants of, have any bearing on this weekend event? To the positive or negative? Very well said. Back when, we worried almost more about events like this one because we knew that it would lead to ennui and a lack of attention later in the season. Which can end up being expensive at least and deadly at most. Anyone else remember Tropical Storm Bill, back in June 2015? It happened right after the Memorial Day floods, so it kind of gets lost in the busy recent history of Houston-area rain/flood events. I remember the “tail” from that storm took forever to get out of the Houston region. Wound up dropping around 5″ or so of rain around town over 2-3 days, more to the west of town around El Campo. Cooled us off nicely after a hot start to June. I’m guessing (hoping) what we’ll see this weekend will be about the equivalent of that. This is precisely why I subscribe to this site! Media hype is just one trying to outdo another. Not worth our time. Thank you for being straight and realistic in your commentaries! Thank you for being a voice of reason! The news and weather is sensationalized too much. In my opinion, all too often it’s entertainment now, not presenting information. Social mediarology–brilliant! What drama kings and queens we are! Thank you for keeping your head when all about you are losing theirs. Please subscribe me. I don’t watch any news or TV forecasts. But I’ve observed the collective anxiety about any ole regular thunderstorm. As a psychologist, it seems to me that Houstonians have a kind of PTSD regarding rain. Understandable after Harvey. And hopefully the anxiety will dissipate with time as we haven’t even passed the one year anniversary yet. Thanks for always giving a calming & non-inflammatory forecast! You’re definitely helping. Enjoy reading factual and non-hyped weather comments.